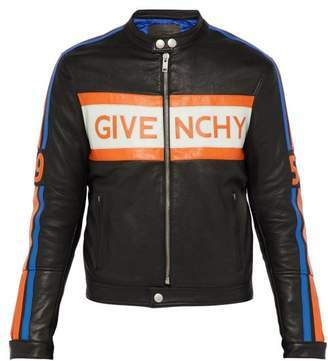 Givenchy - Givenchyâ€™s black leather biker jacket bears the year 1952 on the arms â€“ a reference to the date of Hubert de Givenchyâ€™s first ever collection. Itâ€™s crafted from butter-soft lambskin leather with striking orange and blue appliquÃ© stripes that run down the arms, and features a cut-out logo in white leather on the chest, a blue diamond-quilted satin lining and internal padding that reinforces the bold silhouette. Fits true to size.